-DISTANCE BETWEEN TINES: APPROX. 8.5"
HYDRAULIC FLOW RATING GALLONS PER MINUTE: 15-30 GAL/MIN .THIS FLOW RATE WILL COVER A LARGE MAJORITY OF SKID STEERS. IT CAN BE USED WITH ANY STEER SKID ABC EQUIPMENT RENTAL INVENTORY. 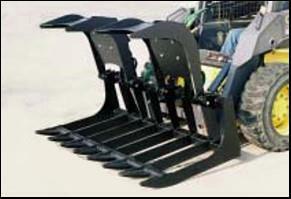 ROOT GRAPPLE FOR SKID STEER LOADERS PERFECT FOR LAND CLEARING, DEMOLITION, CONSTRUCTION, LANDSCAPING, STORM CLEAN UP. -ROOT GRAPPLER LET THE DIRT SIFT OUT WHEN LOADING ROCKS AND TRASH. -HYDRAULIC CYLINDERS OPERATE INDEPENDENTLY TO ADJUST FOR UNEVEN LOADS. * Please call us with any questions about our grapple / root grappler rentals in Tulsa OK and neighboring communities in Northeastern Oklahoma.